Ashland Fire & Rescue has completed an analysis to evaluate the boundary of its existing Wildfire Hazard Zone (WHZ) relative to the standards established by the Oregon Department of Forestry in Chapter 629 of the Oregon Administrative Rules (See Existing WHZ Map 1 and 2). This careful analysis that used new technology has allowed for a more critical look at what areas in the community meet the criteria for a WHZ. See the map of the analysis area here. Each of these four hazard factors are “scored” and there is the possibility of zero to three (0-3) points. After examining all four hazard factors for a geographic area, a numerical value can be assigned to each geographical area that will range from zero to twelve (0-12). If a particular geographical area receives an assigned “Hazard Value” of seven or greater, that geographic area will be designated as part of the jurisdiction’s WHZ. Fire-prone landscaping. Currently, vegetation that produces severe fire behavior and spread such as juniper, cypress, blackberries, and arbor vitae are allowed unrestricted outside of the wildfire hazard zone. See the proposed "Fuel Break Prohibitted Plant List"
Both wood shake roof coverings and fire-prone landscaping were a major factor in the destruction of 11 homes in the 2010 Oak Knoll fire. Expanding the zone would allow the Fire Department to apply for more funding based on the value and numbers of homes truly at risk in Ashland. Click here to read the full WHZ expansion evaluation. 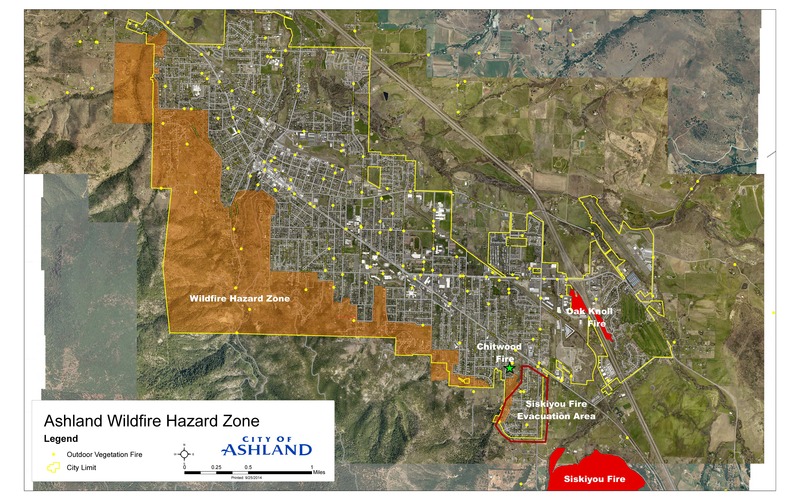 To minimize the impact of fire on our citizens, Ashland Fire & Rescue is proposing to expand the Wildfire Hazard Zone (WHZ) to encompass the entire city limits. This would eliminate hazards like wood shake roofing and flammable landscaping during new construction or remodeling over 200 square feet. The ordinance would not apply to properties where construction is not proposed, but does include any expansion of existing structures requiring a permit. What does it mean for you? See our FAQs. The suggested expansion of Ashland’s WHZ to include the entire city has been approved by the Oregon Department of Forestry and is recommended by the local Division Chief of the United States Forest Service (see WHZ evaluation map 1 and 2). This expansion will be a major step in achieving an improved fire safety for the citizens of Ashland. The new ordnance entitle "Development Standards for Wildfire Lands" is still in draft form and is available for the public here. The ordinance codifies the fuels management objectives that Ashland Fire & Rescue has been enforcing in the current WHZ. Here are some items that the ordinance will address. -Increase the square footage of your home build more than 200 square feet OR build a new structure more than 200 square feet and need a permit. If either of these situations apply, you will need to comply with the primary and secondary fuel break standards. -If you partition or subdivide your property, you will be required to prepare and implement a Fire Prevention and Control Plan which is includes fuels reduction on all parcels. -If you are replacing 50% or more of the roof, the roof is required be a non-wood, Class A or B fire-rated roofing material. -A related municipal code for Prohibited Flammable Plants accompanies the expansion and code elements to prevent anyone in the City from planting known unsafe species within 30 feet of a building. Ashland Fire & Rescue has been working closely with the Wildfire Mitigation, Planning, and Tree Commissions on this process over the past year and a half. 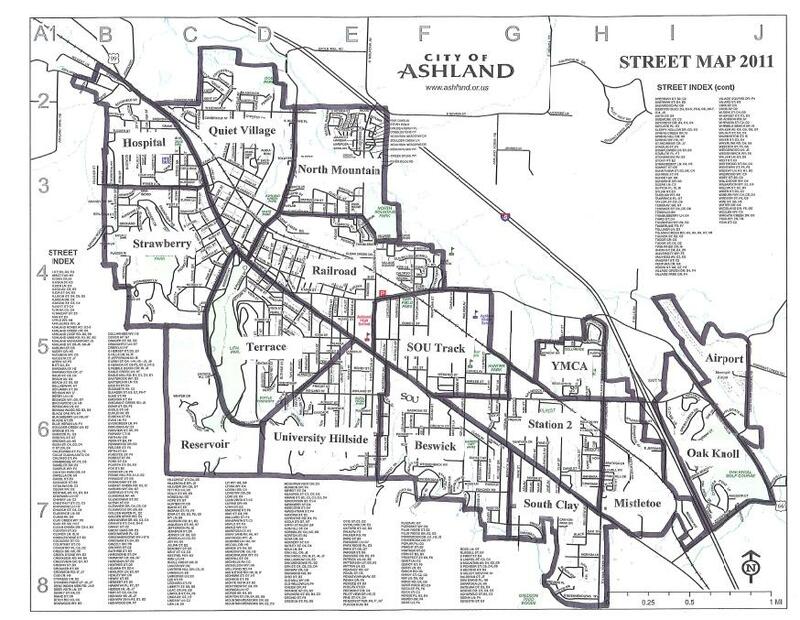 The proposed draft ordinance is a representation of the ideals of these commissions and of the staff at the City of Ashland. For FAQs and other issues pertaining to the WHZ, please click here. Presentation slides from public meeting held September 25th, 2014.